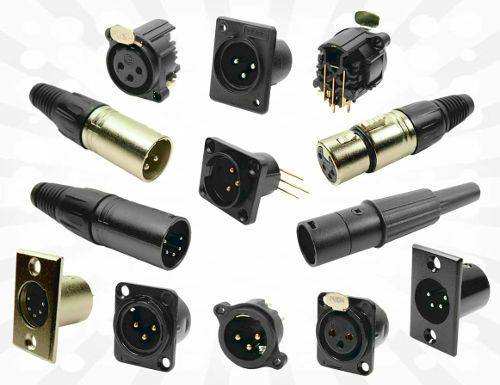 Also see our XLR and feedthrough connectors, jack sockets, jack plugs, optical jacks, phono, and DIN connectors. The Cliff™ range of professional, high quality XLR audio connectors are can be used in numerous applications including professional and consumer audio, broadcast and industrial uses. Most of our components feature a tough polyamide body with special low noise contacts designed to offer an economical alternative to high priced, metal XLRs. They are manufactured to strict quality and performance standards. Our XLRs are available in both solder and PCB mounting styles. For greater reliability, the female connectors have contact pins which provide a large surface area and self-clean upon plug insertion. Rated Current: 3 pin 5A nominal. 15A max, (5A max on series 5). Rated Voltage: 250 Vac max. Operating Temperature: -30° C to + 80° C.
Contact Resistance (after 1000 insertions): 15mΩ max. Dielectric Withstand: 1600Vac between all contacts. Insulation Resistance: >109Ω @ 500 Vdc. Housing: nylon (polyamide), glass reinforced (GF) on some models. Plating: 5μm silver over 5μm of nickel. Gold plating available.